Society of Certified Senior Advisors: Aging in Place: Does It Make Sense to Plan to Stay at Home? Aging in Place: Does It Make Sense to Plan to Stay at Home? It’s a common choice to stay in your own home through the later years of life. But does it make sense to age in place, or is assisted living a better option? According to the Population Reference Bureau, the number of Americans over the age of 65 is expected to more than double by 2060 to over 98 million people. This Silver Tsunami, as it’s been called, brings with it an entire set of challenges, like where older Americans want to spend the last years of their lives. For some, the answer is to age in place – stay in their own homes. Aging in place is a choice that many older Americans are making, because it’s not only more comfortable, but it seems to make financial sense. However, it’s wise to look at both options – aging in place and moving to an assisted living facility – before making any decisions. At first glance, aging in place seems to make the most sense. You stay in your own home, with a few modifications, and continue life as it’s always been. Depending on your current home, however, those modifications can be much more costly than expected. 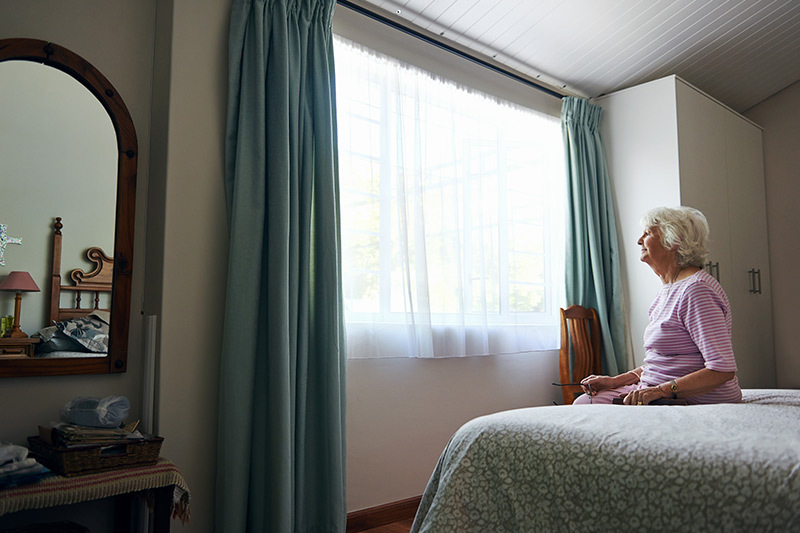 Alert-1 estimates the average annual cost for an assisted living facility in the United States is around $42,600 per year, but the actual cost can fluctuate to more than $100,000 per year, depending on the state you live in. For example, many homecare agencies charge $25-$35 per hour to assist you. At those rates, it doesn’t take very long for in-home care costs to soar higher than the cost of staying in an assisted living community. A typical assisted living community in the Seattle area, for instance, averages $150-160 per day. Use the NAHB’s list of CAPS professionals. CAPS professionals have been trained in the unique needs of older adults through a partnership the NAHB created with several other organizations, including the AARP. Graduates of the CAPS program are listed on the NAHB website. Ask lots of questions. A CAPS professional will not only look at your home and recommend changes, but they can also address your concerns about aging in place. Ask questions about upgrades, renovations and even professionals who specialize in helping you maintain your lifestyle. Find a CAPS professional who fits your style. It’s important to seek out the right person to help you plan for your later years. Spend time with a CAPS professional, and if you find your personalities clash, don’t be afraid to find someone else. It’s your future; be comfortable with the person who will help you design it. Alternatively, aging in place means making changes to the structure of your existing home. In addition, it’s important to consider the cost of having a homecare agency come in later on to help you if, say, you can’t move around your house easily. Lowering cabinets and sinks: $10,000-$15,000. You will not need all of these changes, which is why it’s important to consider hiring a Certified Aging in Place Specialist (CAPS) to help determine which changes you should make. There are also other costs to consider when looking at aging in place. For example, if in-home care is needed, the average cost can range between $980 and $3,800 per month. The amount depends on whether you need basic assistance with bathing and household chores, or whether you need skilled nursing professionals to visit regularly. In some cases, insurance will help pay for in-home care expenses. The real difference, then, is in the one-time expense of upgrading your home to allow you to be as comfortable, and independent, as possible. If aging in place is your choice, then it helps to understand the best ways to get started. An article in the Washington Post points out that most Americans begin making necessary changes well before they turn 65. Some make simple changes, like swapping out round door knobs for levered door handles and installing mobility-friendly showers, while others choose to build or purchase a home that already has these improvements. The key is to start small. Adjustments like comfort height toilets, under-cabinet lighting and roll-out shelving are small expenditures that will mean less stress on your body and more convenience both now and in the future. Then, as funds allow, you can strive for the larger, more expensive renovations like widening doorways, installing a lift or elevator and even investing in technologies like robots and voice-activated home controls. The possibilities are endless when it comes to making home improvements that will allow you stay in your own home as long as possible. The key to making aging in place affordable is to start as soon as possible and make incremental changes. Don’t wait until there is an accident or health issue that makes the changes a pressing requirement. “6 Thing You Must Know About Aging in Place,” May 2015, Kiplinger’s Personal Finance. “Fact Sheet: Aging in the United States,” January 2016, Population Reference Bureau. “Senior Living Options & Costs,” November 2012, Alert1 Blog. “3 Reasons Why Aging in Place May Not Be Cheaper,” August 2016, MyLifeSite.net. “Aging-in-Place Options Most Popular with Baby Boomers,” Tim Savoy, March 2016, The Washington Post. “Aging in Place Versus Lifecare Community: How to Compare the Costs,” Senior Care Advice. “Aging in Place: Facilitating Choice and Independence,” Fall 2013, Office of Policy Development and Research, U.S. Department of Housing and Urban Development. “Measuring the Costs and Savings of Aging In Place,” Fall 2013, Office of Policy Development and Research, U.S. Department of Housing and Urban Development. “The Real Cost of Aging,” Jeff Anderson, August 2016, Senior Living Blog, A Place for Mom.